Includes 30 lessons plus Hanyu Pinyin Reading instruction on 16 CDs (15 hrs 45 minutes), plus Reading Booklet and User's Guide. Did you know that Mandarin is the world’s most widely spoken language with over one billion native speakers? Once you get the basics down, you’ll be surprised how quickly you’re able to begin speaking it. And even knowing a little bit of the language will make travel to China far easier, and much more fun. Whether your goal is to travel, communicate with friends or colleagues, reconnect with family, or just understand more of what’s going on around you, learning to speak Mandarin will expand your horizons and immeasurably enrich your life. What’s Included in Pimsleur’s Chinese (Mandarin) Level 5? - Thirty, 30-minute audio lessons, plus one hour and 15 minutes of Hanyu Pinyin Reading Lessons. 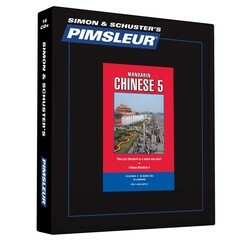 Pimsleur’s Chinese (Mandarin) Level 5, designed to be taken after Level 4, builds upon skills taught in Pimsleur’s Chinese (Mandarin) Levels 1-4. 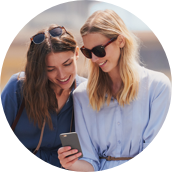 The thirty 30-minute lessons, plus the Hanyu Pinyin reading practice, will enable you to speak and understand Mandarin with near fluency and with a broad range of conversational skills. In Level 5 the pace and conversation moves quite rapidly, accelerating exposure to new vocabulary and structures, approaching native speed and comprehension. You’ll learn to speak more in-depth about your personal life and emotional state, and be able to create complex sentences using a mix of tenses and moods. - Food and drink: restaurants, street vendors, favorite dishes, delicious drinks, discussing differences between Chinese and American diets. Reading Lessons are included at the end of Lesson 30. These lessons are designed to teach you to read Hanyu Pinyin (pinyin for short) the official phonetic system for transcribing pronunciations of Chinese characters into a Latin alphabet. Totaling one hour 15 minutes, the lessons will teach you to sound out written words with correct pronunciation and accent. A Reading Booklet to be used with the audio lessons is included in PDF format. Over one billion people speak Chinese. The two most common dialects are Mandarin and Cantonese. They are not mutually intelligible. Mandarin is the official language in Mainland China, Taiwan, and Singapore. The Mandarin dialect is used in most Chinese schools, and in most TV programs, movies, and radio stations throughout the country, and even in Guangzhou (formerly Canton), where people speak Cantonese in their daily lives. Mandarin is one of the six official languages of the United Nations.